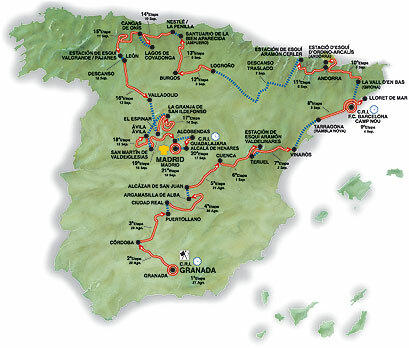 December 15, 2004: The 2005 Vuelta a España route was officially unveiled today. It will be raced from August 27 to September 18. 8. David Bernabeau (Comunidad Valenciana) s.t. 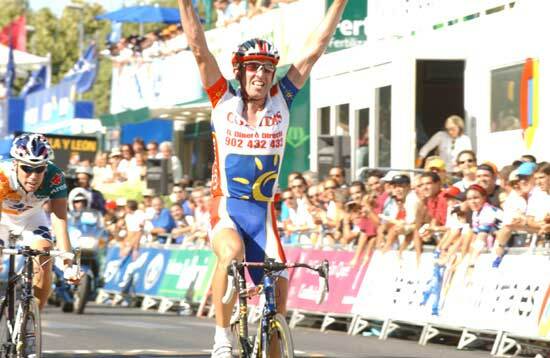 McGee missed the stage win, but he got the bigger prize with the Vuelta leader's Golden Jersey. Photo courtesy Unipublic. Thanks, guys! 2. Bradley McGee (FDJ) s.t. 3. Juan Antonio Flecha (Fassa Bortolo) s.t. 4. Francisco Javier Vila (Lampre) s.t. 5. Angel Vicioso (Liberty Seguros) s.t. 4. Angel Vicioso (Liberty Seguros) s.t. 5. Giosue Bonimi (Lampre) s.t. 2. Thor Hushovd (Credit Agricole) s.t. 4. 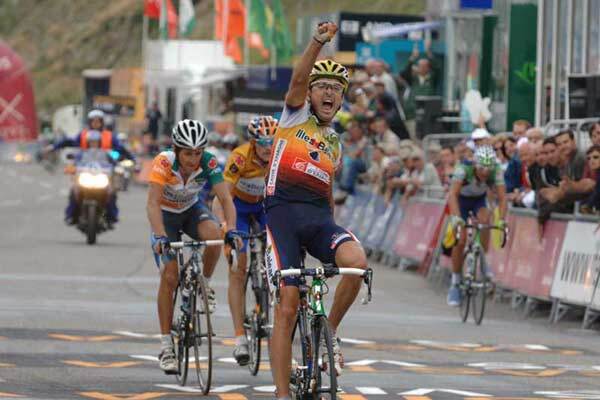 Marco Zanotti (Liquigas) s.t. 5. Tom Steels (Davitamon-Lotto) s.t. 2. Miguel Martin Perdiguero (Phonak) s.t. 5. David Blanco (Cominidad Valenciana) s.t. 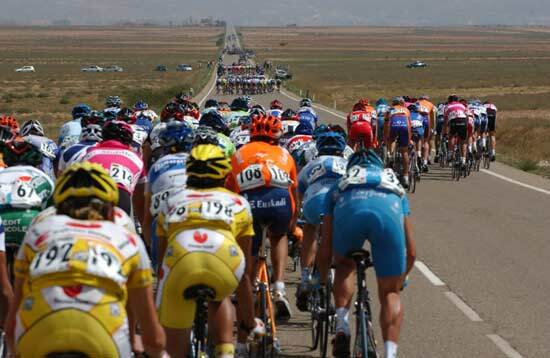 Note that the field has been broken into at least 5 echelons, proof that the day's racing was really tough. 6. Francisco Mancebo (Illes Balears) s.t. 3. Alberto Ongarato (Fassa Bortolo) s.t. 4. Francisco Jose Ventoso (Saunier Duval) s.t. Mancebo wins a tough one. Just behind him are Heras and Menchov. 3. Denis Menchov (Rabobank) s.t. 3. Roberto Heras (Liberty Seguros) s.t. 4. Francisco Mancebo (Illes Balears) s.t. 5. Denis Menchov (Rabobank) s.t. 6. Carlos Garcia Quesada (Comunidad Valenciana) s.t. 8. 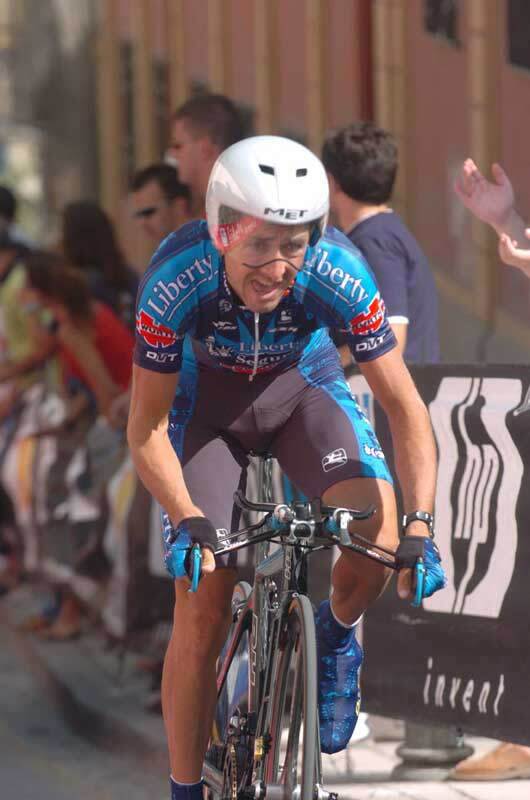 Tom Danielson (Discovery) s.t. 2 Erik Zabel (T-Mobile Team) all s.t. 4 Oscar Sevilla ( T-Mobile), s.t. 10 Carlos Sastre (CSC) s.t. 9 Carlos Sastre (CSC), s.t. 2 Alessandro Petacchi (Fassa Bortolo), s.t. 3 Miguel Angel Martin Perdiguero (Phonak), s.t. 4 Joaquin Rodriguez Oliver (Saunier Duval), s.t. 5 Samuel Sanchez (Euskaltel), s.t. 6 Mauricio Alberto Ardila Cano (Davitamon - Lotto), s.t. 7 Erik Zabel (T-Mobile), s.t. 8 Pablo Lastras (Illes Balears), s.t. 9 Thomas Ziegler (Gerolsteiner), s.t. 10 Roberto Heras Hernandez (Liberty Seguros), s.t. 5 Ruben Plaza Molina (Comunidad Valenciana), s.t. 6 Oscar Sevilla (T-Mobile), s.t. 8 Carlos Sastre ( CSC), s.t. 9 Roberto Heras Hernandez (Liberty Seguros), s.t. 2 Javier Pascual Rodriguez (Comunidad Valenciana), s.t. 5 Oscar Pereiro Sio (Phonak), s.t. 7 Pablo Lastras (Illes Balears)-Caisse d'Epargne, s.t. 2 Martin Elmiger (Phonak), s.t. 3 David Latasa (Comunidad Valenciana), s.t. 2 Roberto Heras Hernandez (Liberty Seguros), s.t. 3. Heinrich Haussler (Gerolsteiner) s.t. 4. Smuel Sanchez (Euskaltel) s.t. 5. Jimmy Casper (Cofidis) s.t.